1. 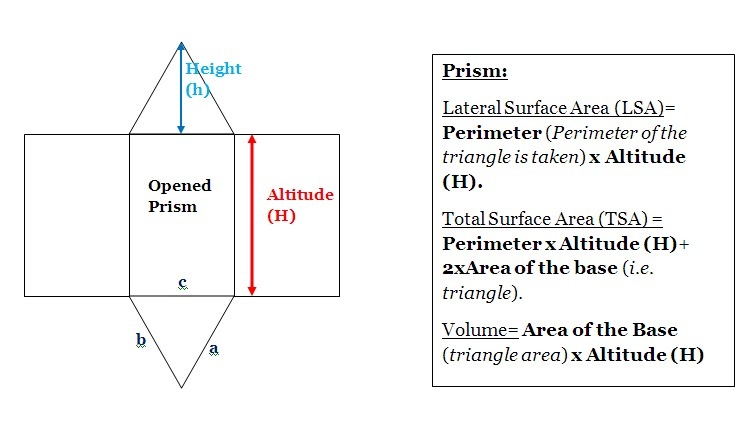 A prism with triangular base with sides AB=5cm, BC=8cm, and CA=7cm and Altitude (H)= 9cm. Find the Lateral surface Area, Total surface area, and Volume? 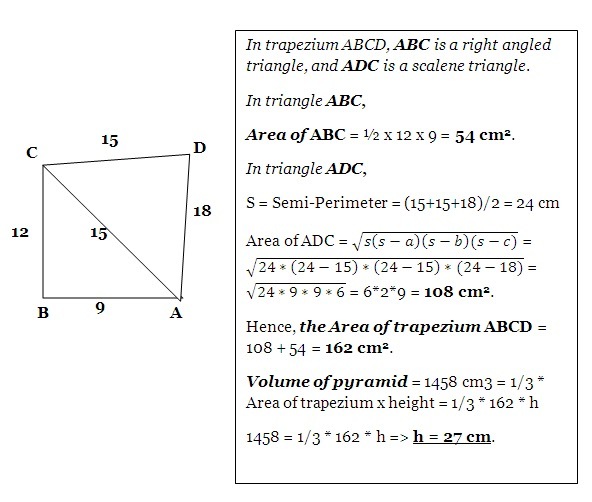 Ans: Since, triangle ABC is scalene triangle. The area of ABC = √10*(10-5)*(10-8)*(10-7) = √(10*5*2*3) = 10√3. 2. A pyramid with trapezium base with sides AB=9cm, BC=12cm, CD=15cm, and DA=18cm. The Volume of pyramid = 1458 cm3. Find the Height (H)? 3. 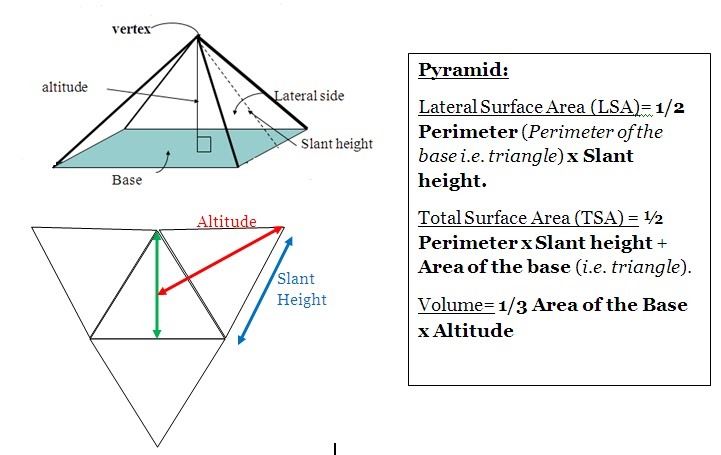 A rectangle based pyramid, length and width of the base is 18 cm and 10 cm respectively. Find the total surface area (TSA), if its height is 12 cm? 4. A regular tetrahedron has surface area of 144√3. Find the side, volume and Total surface area (TSA)? => side2 = 144 => side = 12 cm. => TSA = 3√3/4 * side2 = 3√3/4 * 122 = 27√3 cm2. 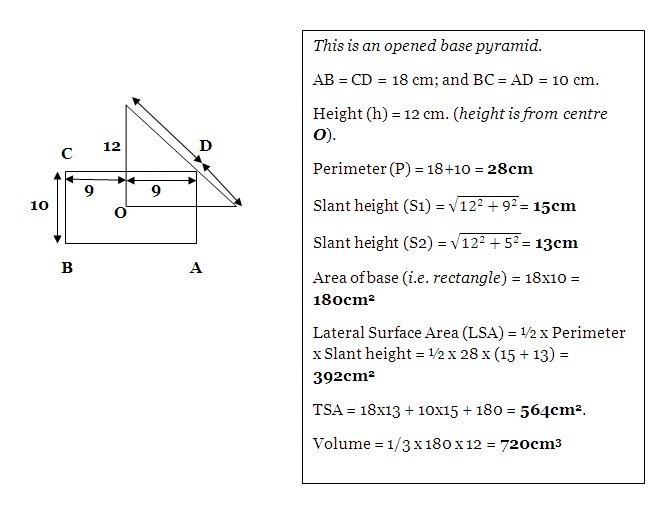 Comments "Basic Formula and Questions on Prism and Pyramid for SSC exams"